Just over 2 years ago, when I told family, friends, and colleagues that I was taking a new position at The Corning Museum of Glass, several wondered aloud what I would be doing at a casserole museum. Such a response shows the widespread public association of glass, Pyrex, and home-cooked meals! On view through March 17. 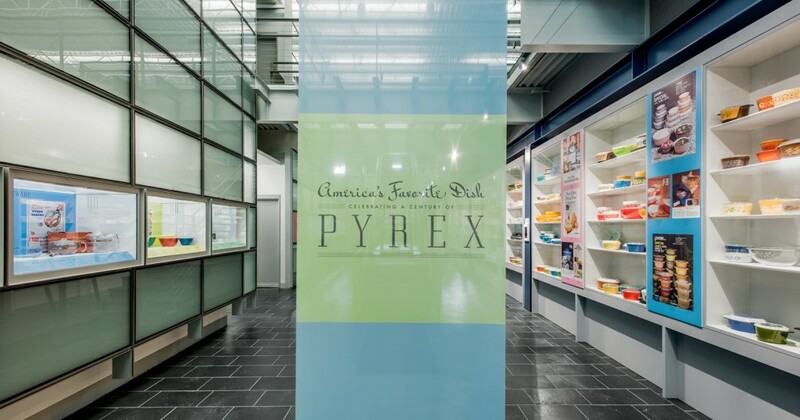 Like many people, when I walk through the Pyrex exhibition at the Rakow Library, I am connected to events and experiences in my past: one white bowl takes me back to my childhood, mixing batter in my grandmother’s kitchen; a red and white version leads me back to my mother’s New Year’s Eve tradition of making olie bollen, a Dutch fried treat that I continue to make once a year; a stove top coffee percolator captures my attention almost as much as it did decades ago as a child; a casserole dish transports me back to a small town in Central Washington, where I taught high school as a newly married college graduate. That wedding gift enabled my wife and me to attend the potlucks at church, in the homes of friends and at work that soon followed. Since then, we have lugged around food transported in a variety of Pyrex containers augmented with an array of lids and holders. 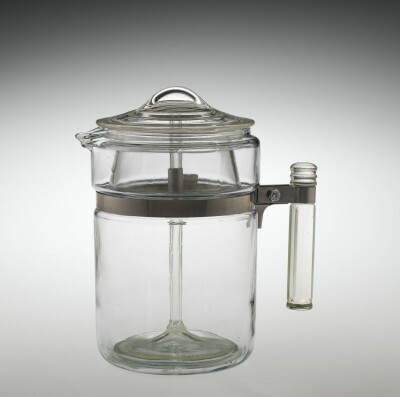 The coffee percolator was, and still is, my favorite Pyrex home product. Seeing water slowly transform into coffee right in front of your eyes is a kind of magic, not unlike carrying out chemical experiments in Pyrex labware. Of course, it’s really not that different; cooking, baking, or brewing coffee all involve using heat to control chemical reactions that transform ingredients into new creations that ideally entice your eyes with their presentation, engage your palate with tantalizing tastes and smells, nourish your body with healthful nutrients, and sustain your soul with satisfying comfort. What more could one want?